The ceiling is the forgotten wall and is often left empty. 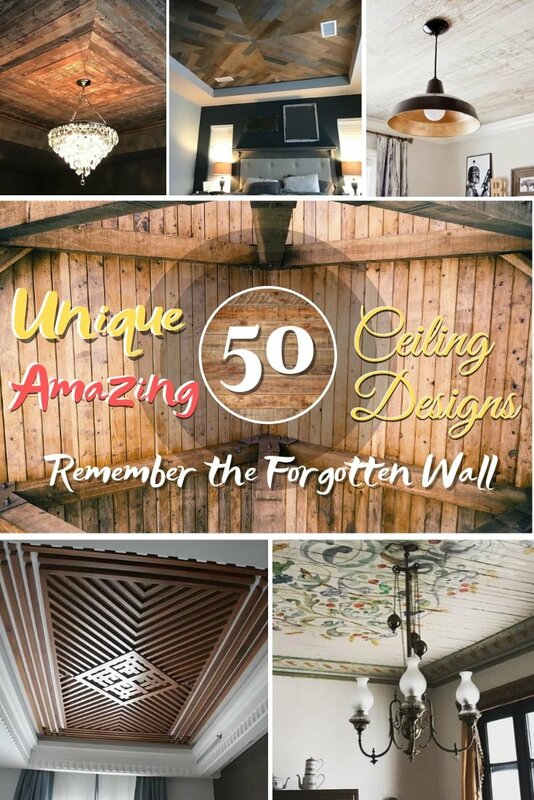 If you’re looking to fix this decor mistake, here are 50 unique ceiling design ideas for your inspiration. When it comes to current ceiling design, anything goes. People have come to regard ceilings as blank canvasses, rather than surfaces that should be left blank, dull, and white. 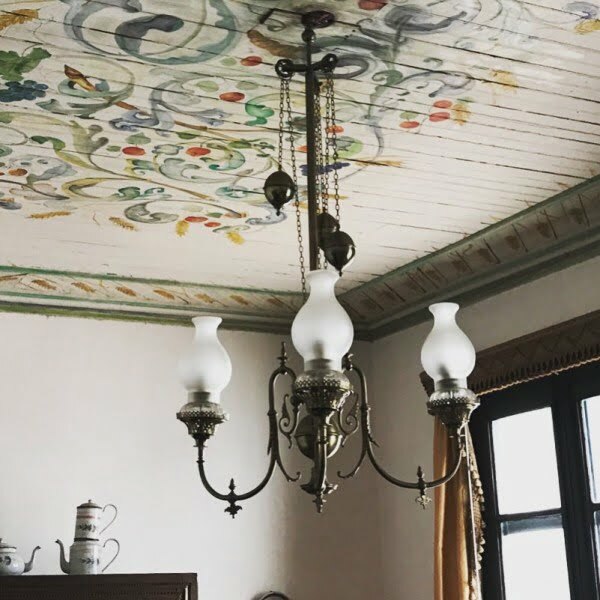 Gone are the days when ceilings were neglected as areas worthy of expending some time and decorating effort; their transformative potential can be unlocked in some finishing details. There is a design theory that suggests the lion share of decor effort should be aimed at adding architectural elements to space and that they alone can carry an entire room. Changing a room’s bones does give it an entirely different feel, more so than simply adding some throw pillows or a new color. For those wanting to transform and elevate a space, don’t forget the ceiling. 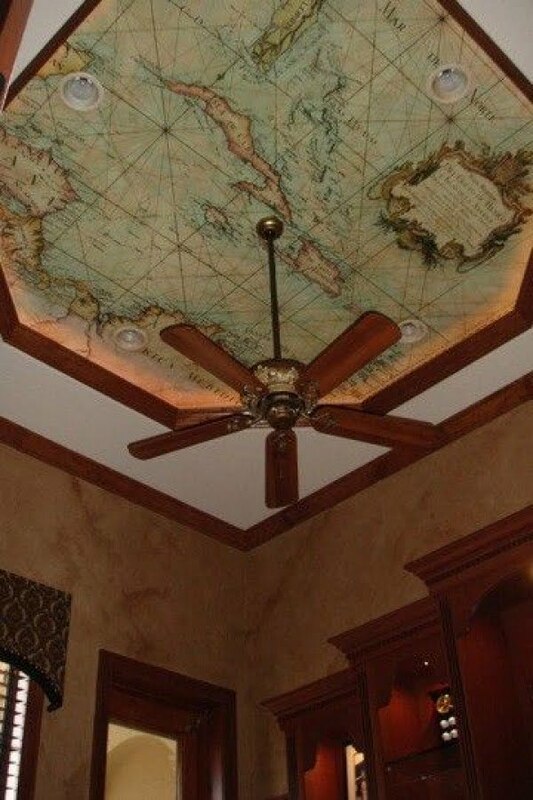 If you are looking for a way to up the ‘wow’ factor of a room, use these 20 ceiling design ideas to inspire and guide you. Many homeowners put great effort into designing and decorating every room in the house but neglect to do anything about the ceiling. 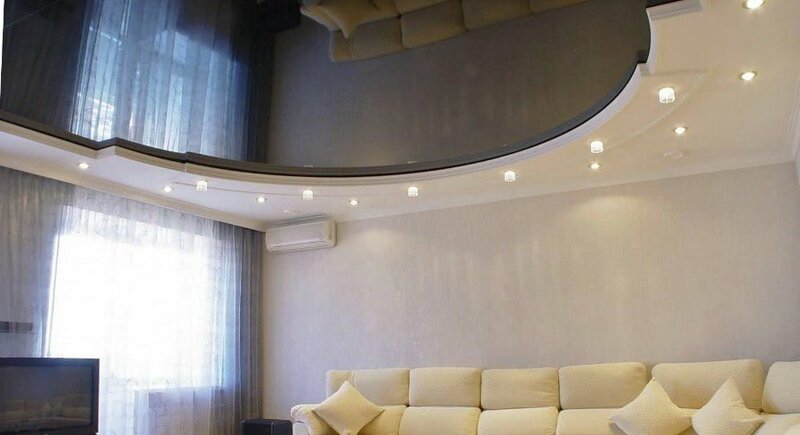 However, ceiling designs for living room can provide the space with a unique vibe, transforming it into a conversation piece and a very impressive focal point. There are many different colors, patterns, and styles to choose from. 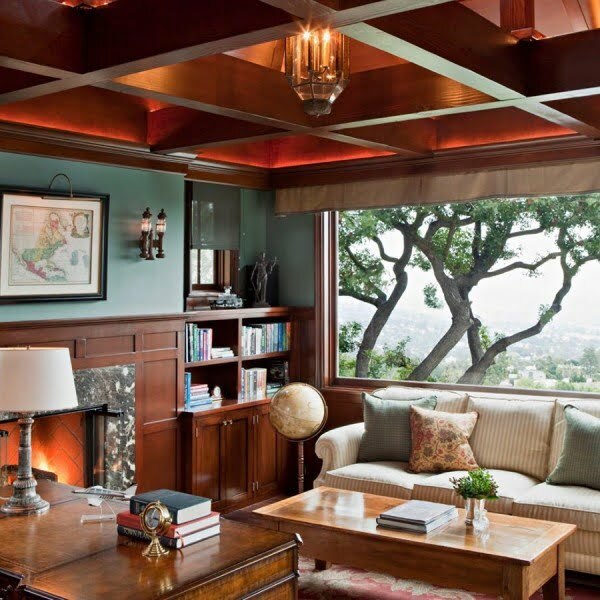 Among other designs, you could go for a coved ceiling, a drop ceiling, a tray ceiling or a beamed ceiling. 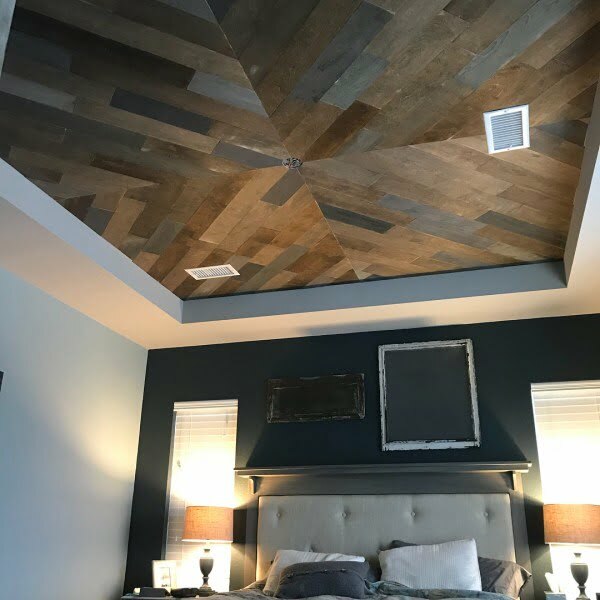 However, the ceiling design you ultimately choose will vary according to factors like budget, available space, and the existing design theme. Done tastefully, your ceiling design can give that space an exceptional and exclusive look and feel. This ceiling is reminiscent of one you would find in a mosque. It has an arched-dome shape, with a rounded, curved framing detail where the ceiling meets the walls. 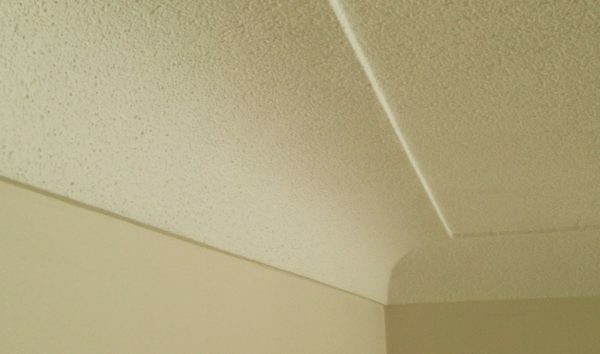 This design provides a smooth, soft and rounded finish by eliminating the sharp 90 degree angles of the standard ceiling. This ceiling is a recessed or inverted rectangular architectural feature, which can be subtle, plain or dramatic. Lighting is typically a prominent feature of this ceiling. It breaks up a regular flat ceiling line to inject architectural interest. 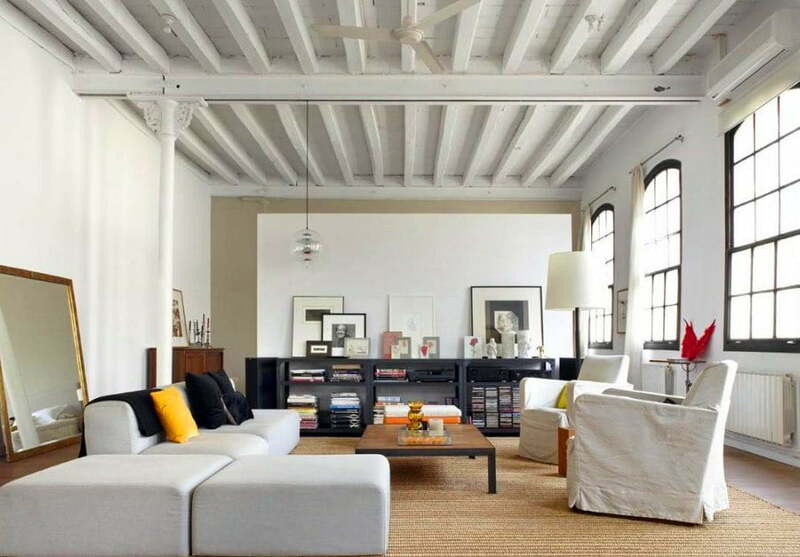 This ceiling design features exposed beams and joists. It brings individual flair to space and creates visual interest. 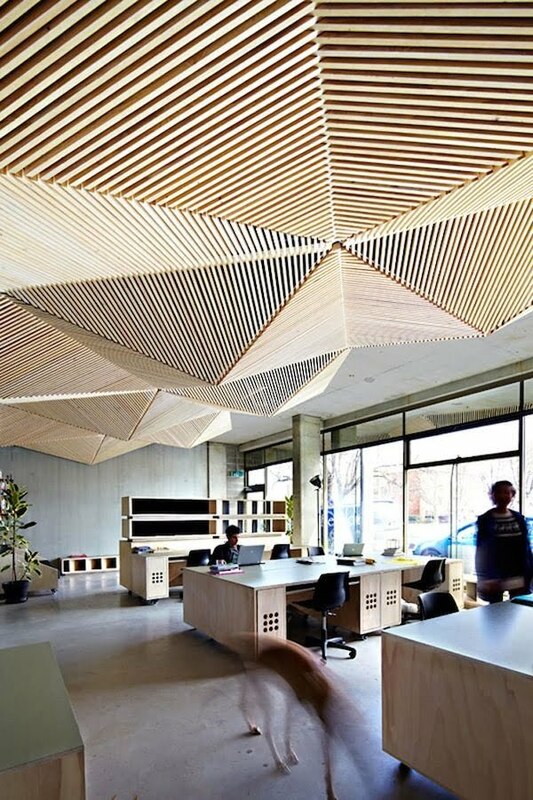 Typically, these ceilings are made out of wood; however, other materials can be used as well. Your living room reflects your personality. 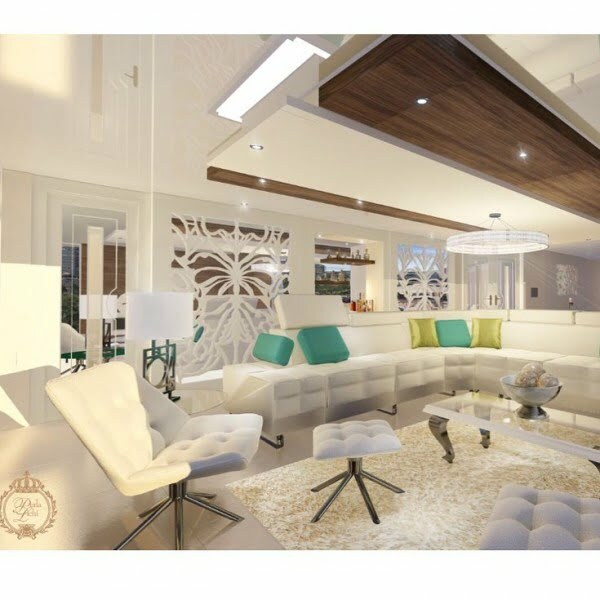 The décor, choice of furniture and the design of the ceiling showcase your style. 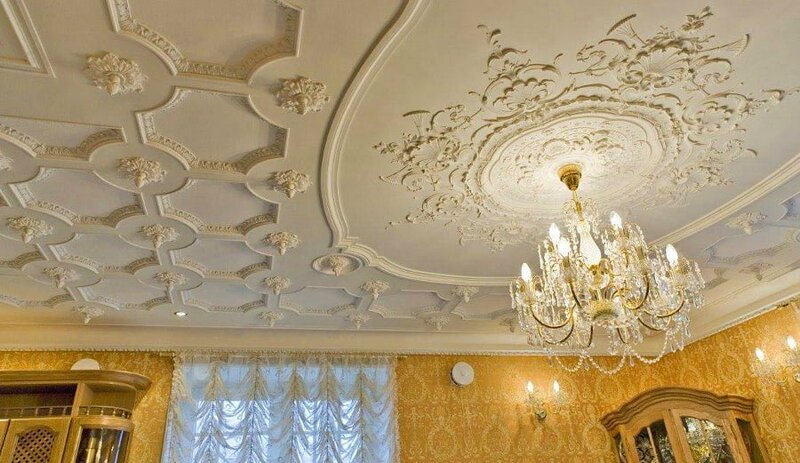 You can inject finesse into your living room by choosing from an array of artistic, cheerful, classy and adventurous ceiling designs. Go ahead and make that excellent first impression. 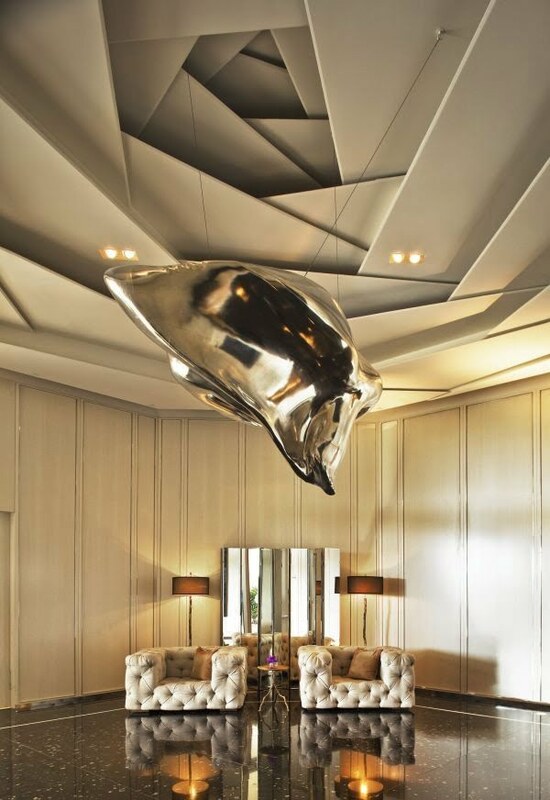 Like a blank canvas, the ceiling offers some ways to take interior design to the next level. 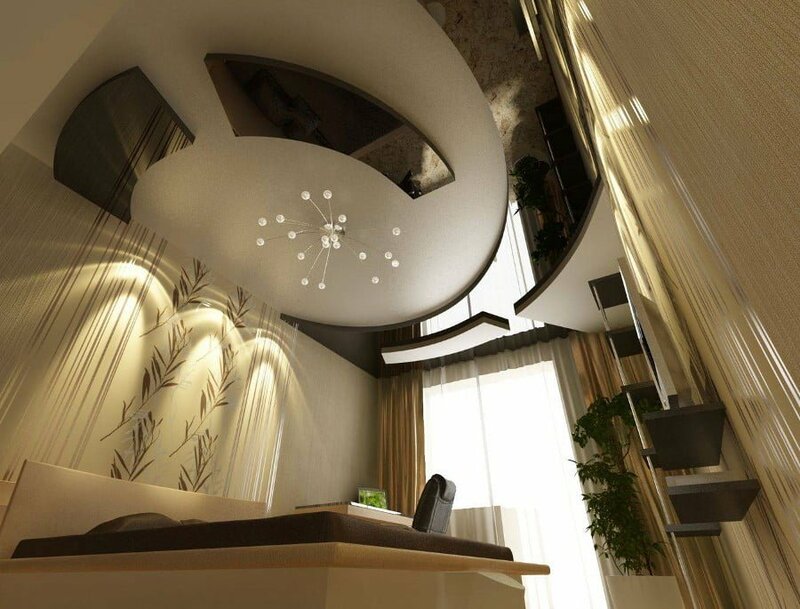 The design of the ceiling should fit into the kind of interior you would like to achieve. 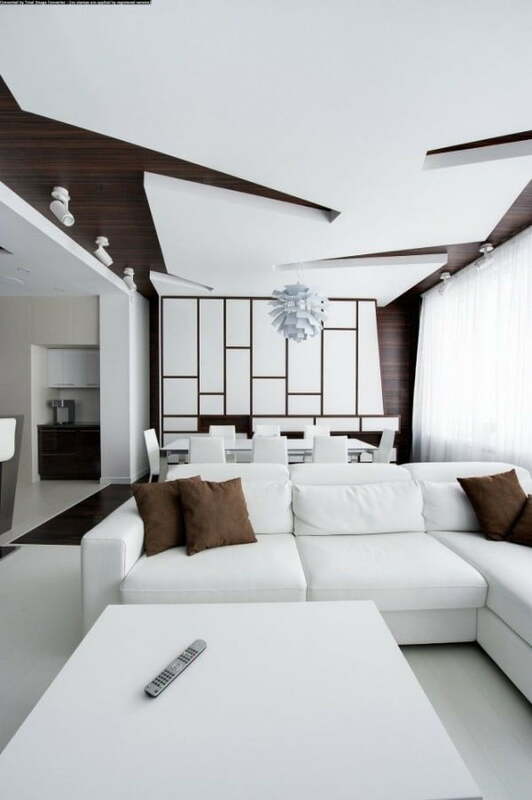 Modern ceiling design involves finding a balance between functionality and sophistication. 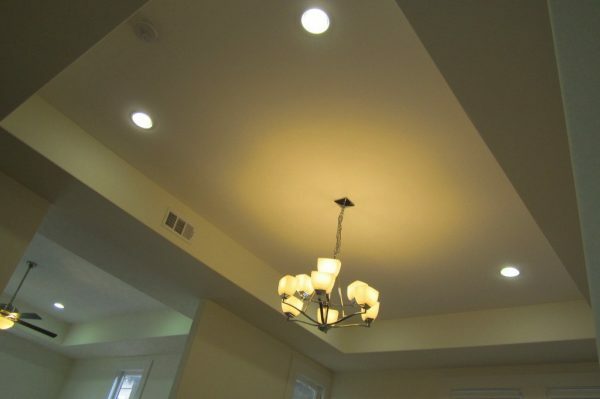 Installing recessed lights in a drop ceiling is one way of capturing a modern ceiling. This could either be on the sides of the room or in the center. 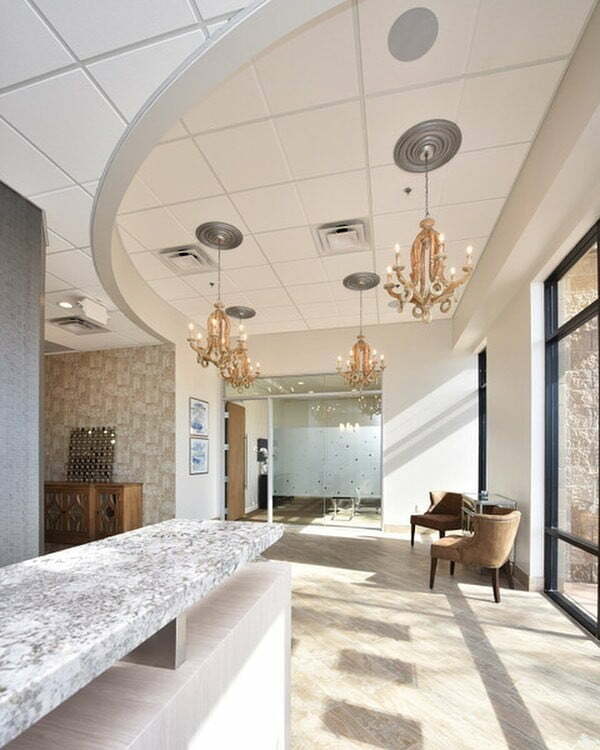 Additionally, textures can be added to the ceiling for a modern look. Architectural interest can be added to the modern space through a tray ceiling. This will inject a bit of elegance into an otherwise ordinary room. 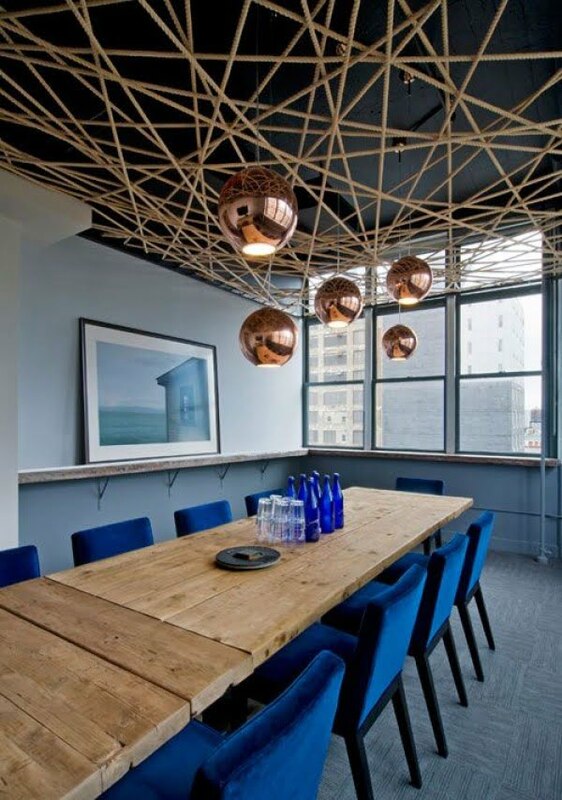 Value is also added to space via the woodwork used to build the tray ceiling. 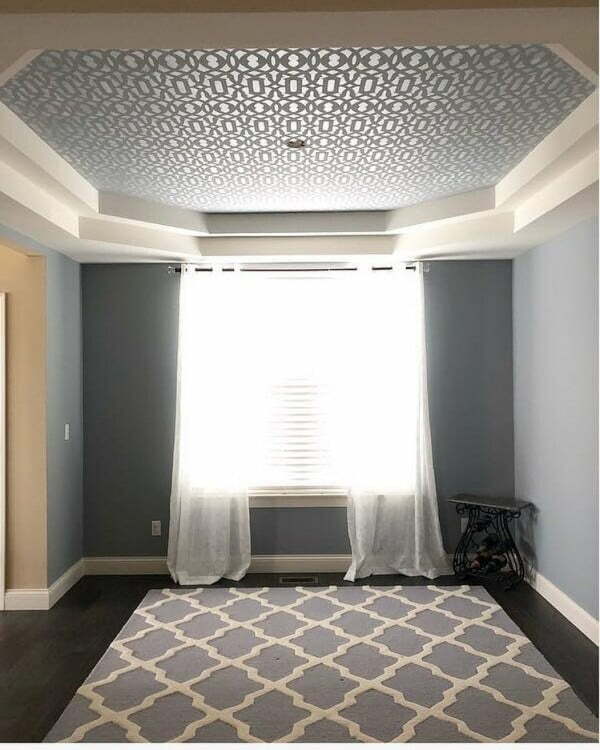 The tray ceiling features a middle section that is several feet or several inches higher when compared to the areas around the room’s perimeter. 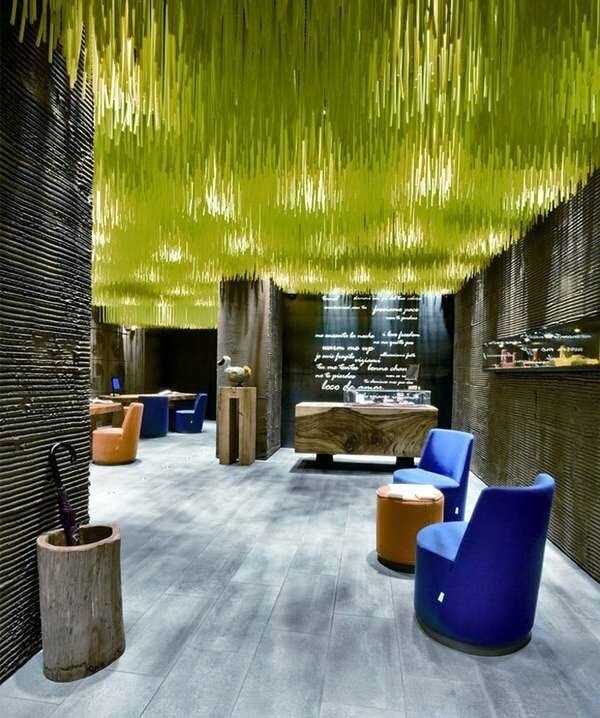 The design allows for colors to be effortlessly used to transform a bland ceiling into a fascinating focal point. The vaulted ceiling is another modern ceiling design that can be used to bring interest to space. This ceiling features slopes that can be angled to match the shape of the roof. Also, vaulted ceilings can have equal slopes that converge in the center. There are also vaulted ceilings that feature a single slope and some that are uneven. 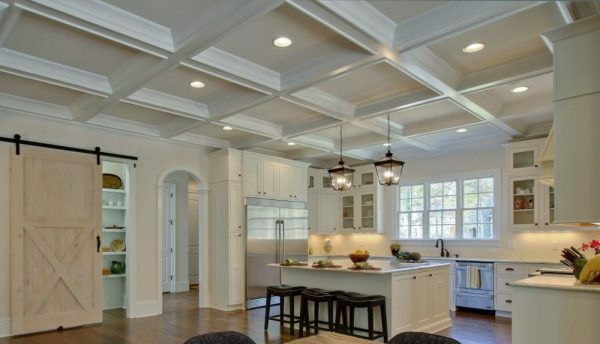 The coffered ceiling can also create interest in modern design. It features repeating sunken rectangular or square panels. Typically, the ceiling fan or central lighting fixture is suspended from the centermost panel. Recessed lighting can be used as well. 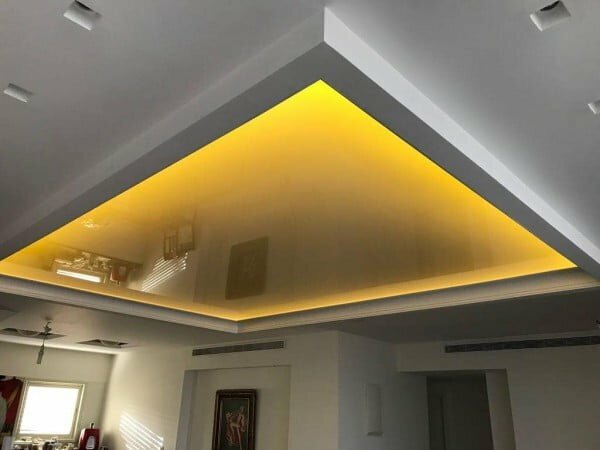 Lighting is another essential component of the modern ceiling design. It can be hidden in a tray ceiling design. 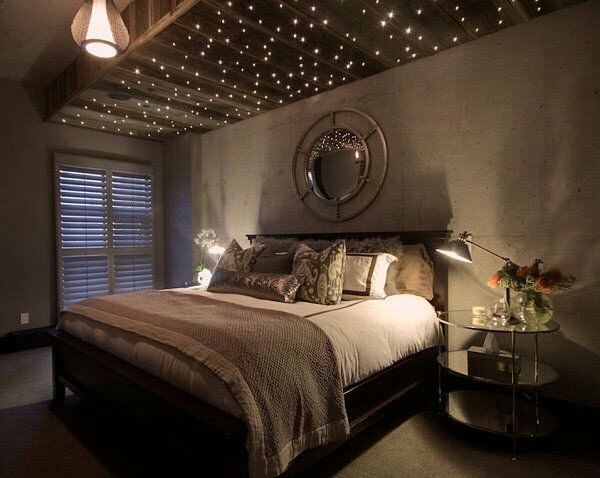 Lighting can also be placed behind a gossamer canopy to get a dreamy effect. Stretch ceilings are becoming more and more popular. Adding a glossy stretch film to a ceiling makes it reflect what is going on beneath, giving the space a multi-dimensional feel not easily duplicated. Wall paper comes in so many options these days, and wallpaper that replicates wood planks can be shockingly authentic looking. 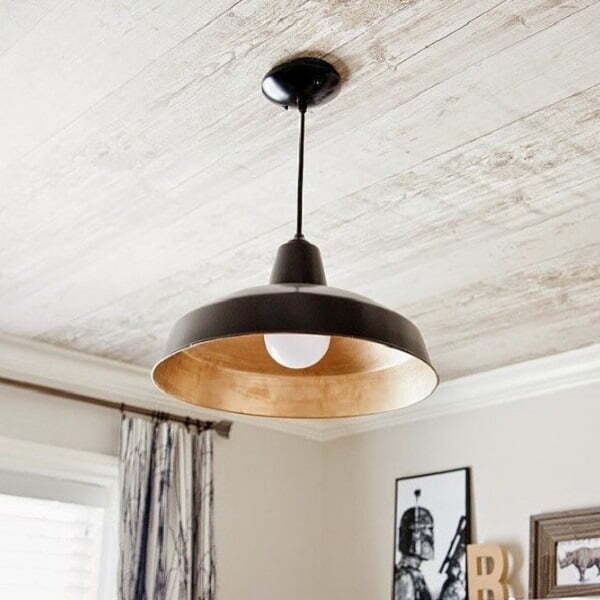 Adding wood plank wallpaper to a ceiling gives the room a warm, cozy farmhouse feel. Having a portion of the ceiling recessed makes space feel smaller and more intimate. Adding a stretch film and some lighting makes the area feel positively dramatic and theatrical. 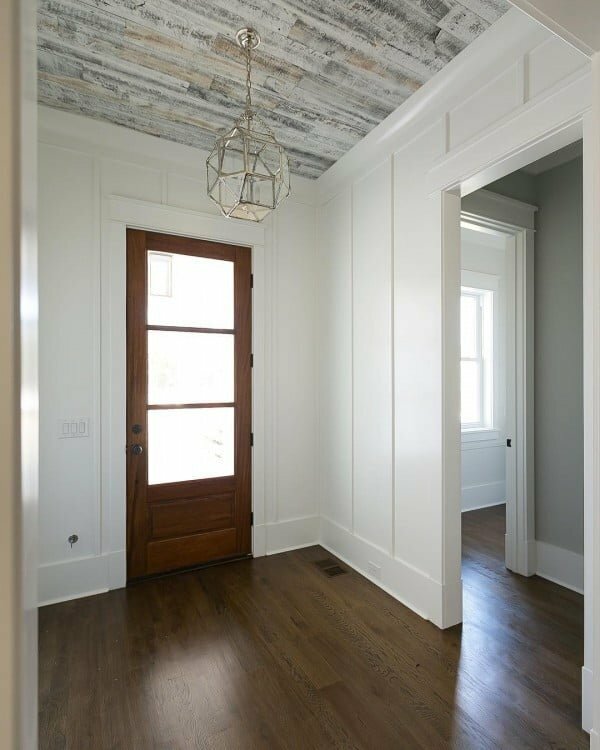 Adding some reclaimed wood planks to an entryway ceiling is a great way to detach the space while adding that oh-so-charming farmhouse feels. Adding a drop-down grid ceiling gives the room some architectural panache while warming up space and just begging for the eyes to look upwards. 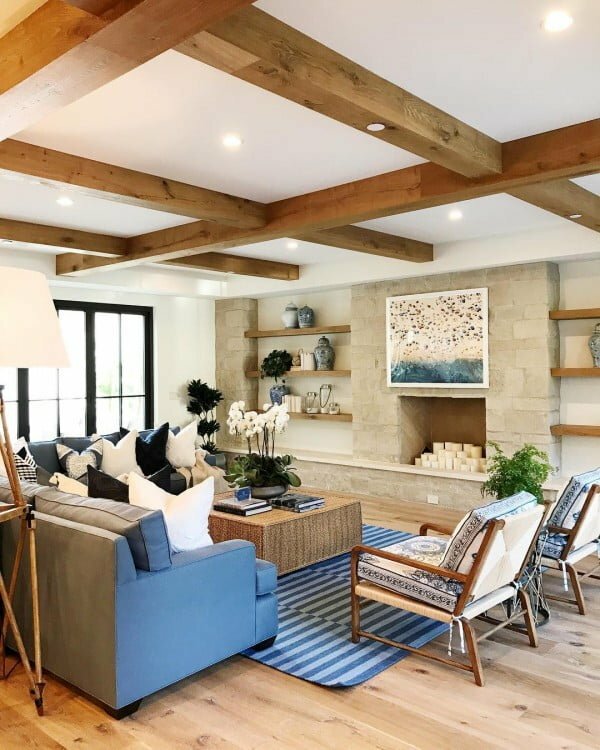 Adding wood beams to a ceiling goes a long way regarding adding a rustic cabin-like vibe. Having a white grid-style ceiling instantly makes space feel more contemporary, airy and light. Adding wall paper to a ceiling in a dining room with a bold pattern gives the eyes something to feast on while guests dine and admire. The bold pattern lends the space a sense of sophistication and depth. When a portion of the ceiling drops down, there are few things more interesting in the space. Adding some wood and light features to the drop-down part makes this the ultimate in architectural interest. 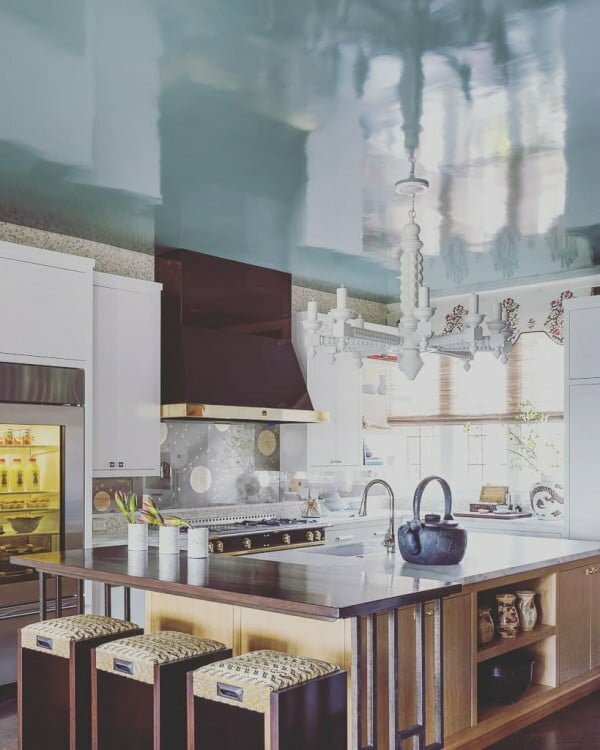 A high-gloss stretch ceiling is reflective and soothing, and in a relaxed tone like blue, it gives a look and feels of having calming waters overhead. Inverting the traditional use of wood flooring and having it on the ceiling, instead of the floor, gives a room a sense of unique modernity as the space questions the boundaries of decor style. 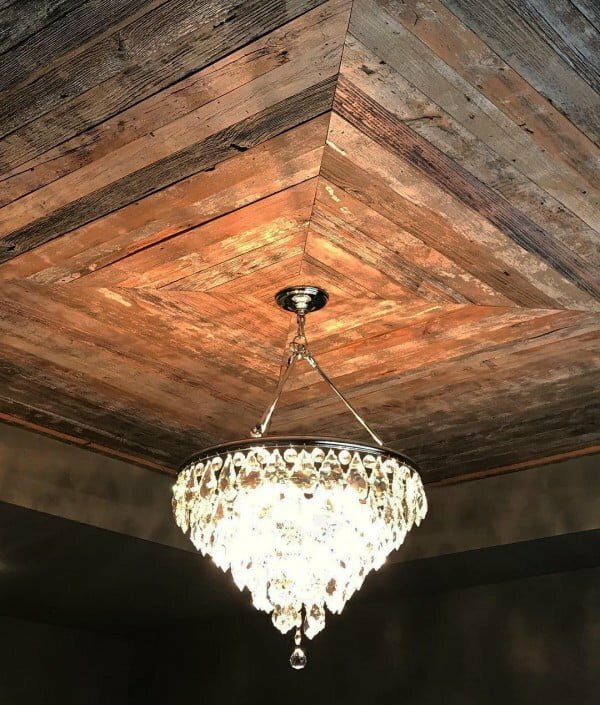 Pairing rustic wood and a glamorous chandelier on the ceiling makes a stunning contrast, one that will be hard to look away from. 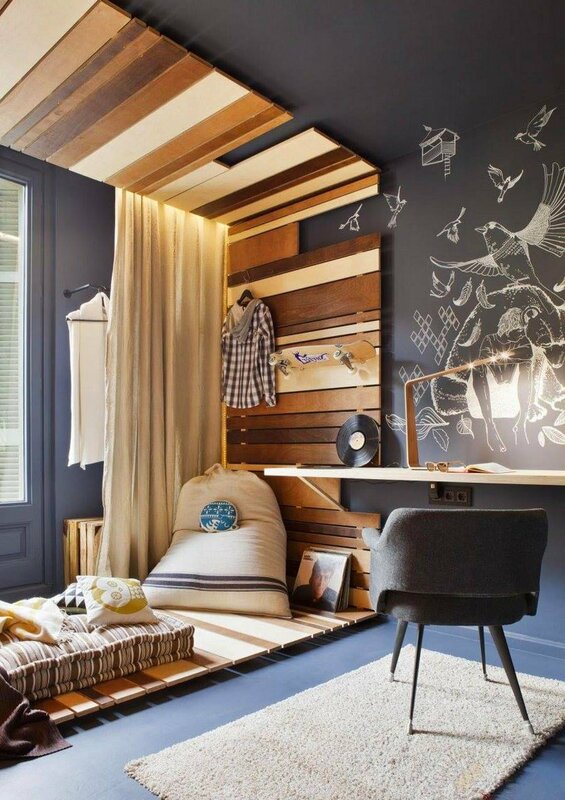 Adding wood planks, in various dark tones, to a bedroom designates the room as cozy, warm, and intimate. 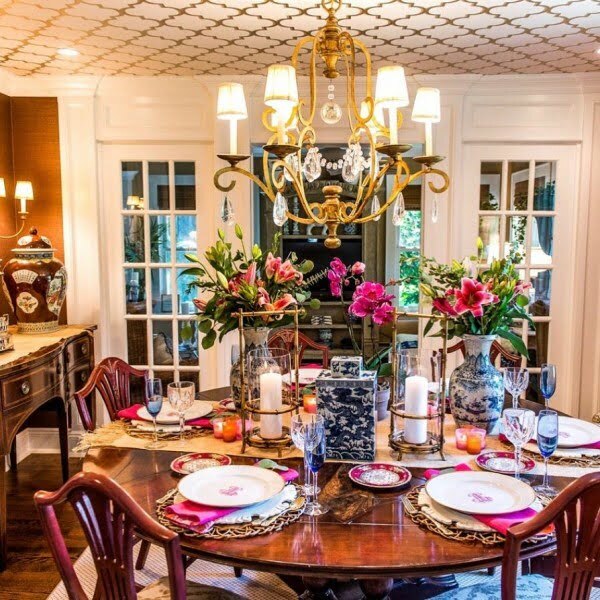 Stenciling a bold pattern in a recessed ceiling is the ultimate in decadence and glamour. A recessed ceiling with a bold millwork pattern inside adds a stunning amount of visual interest to any space. 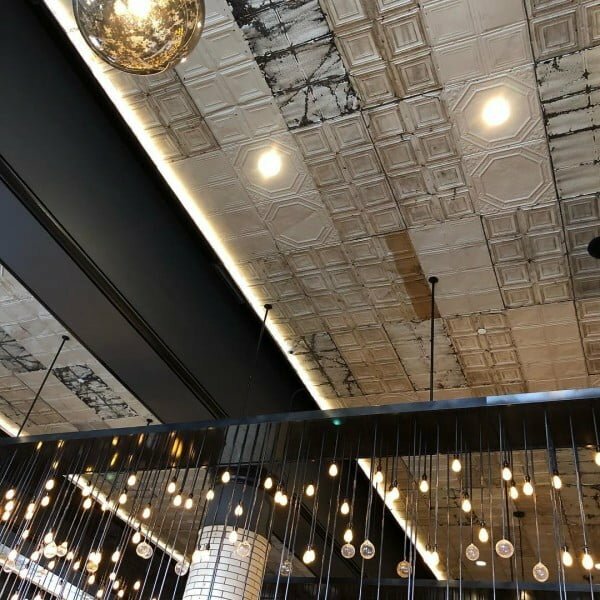 Having a fresco-style ceiling invokes images of cathedrals and mural-painted walls in ancient magical locals, lending the space a richly historical feel. 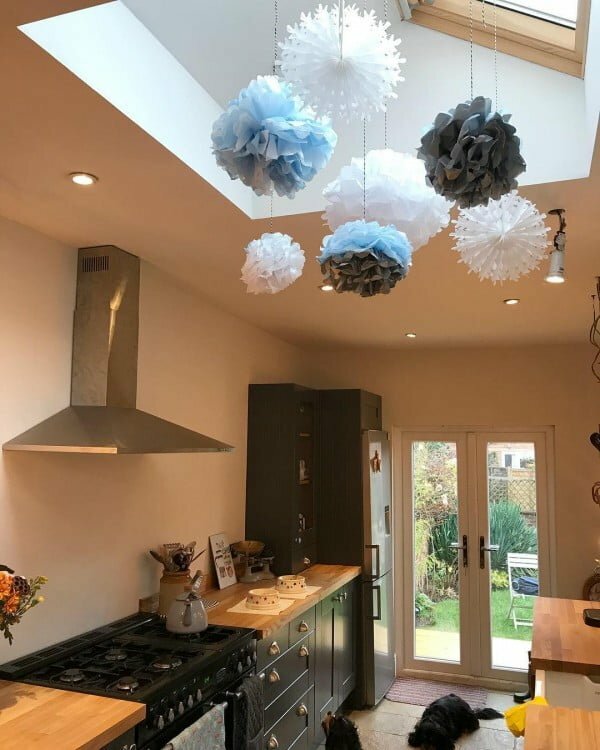 Hanging pom poms dangling overhead from the ceiling breathes whimsy and frivolity into space in a way few other things can. 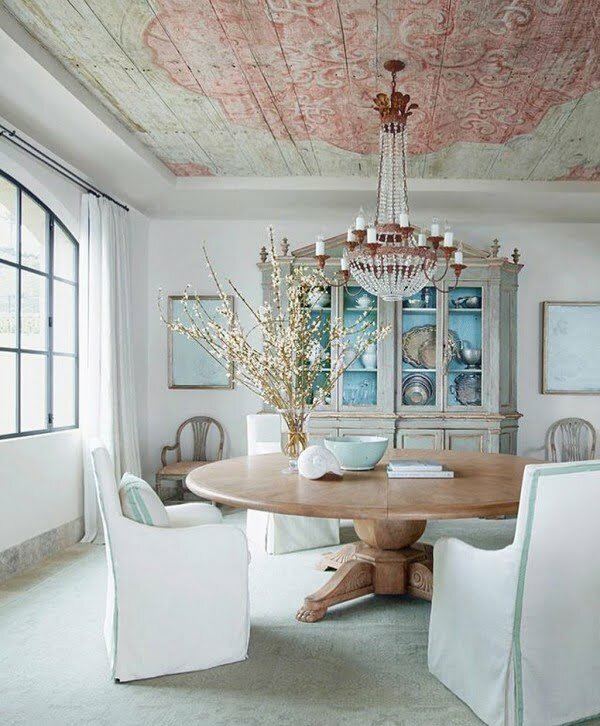 Having a painted ceiling overhead in a dining room perfectly centered over the table creates an intimate feel of cohesion and balance. Few things are more authentically farmhouse than having a touch of that country gingham pattern in a space. 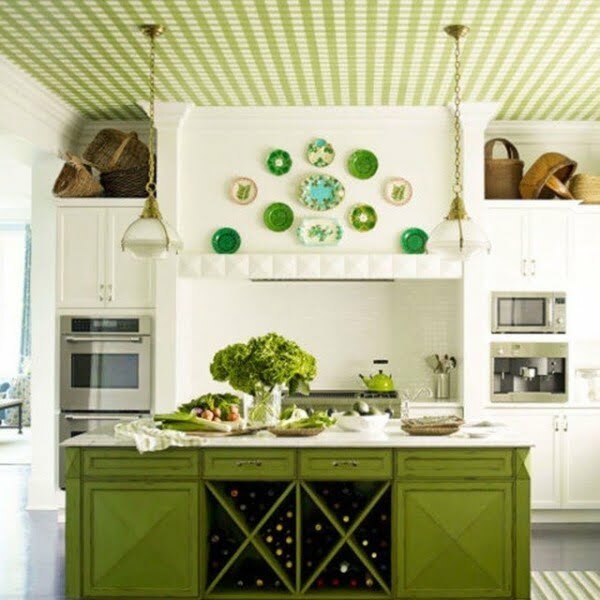 Applying it in wallpaper form to a ceiling instantly gives a kitchen a welcoming country vibe. 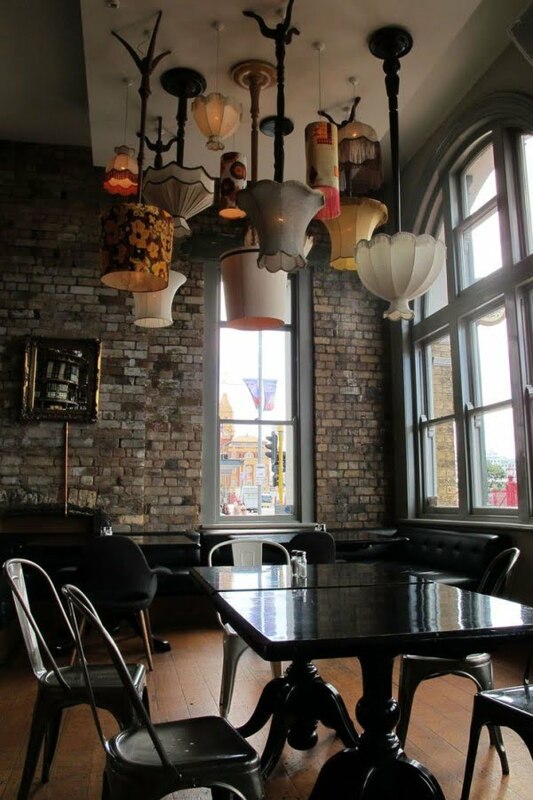 Adding a series of vintage panels to a ceiling instantly transforms a space into something interesting and unique. It begs for the eyes to face upwards taking it in and admiring the intimacy it brings. The ceiling is a blank canvas, so murals do a lot for creativity. 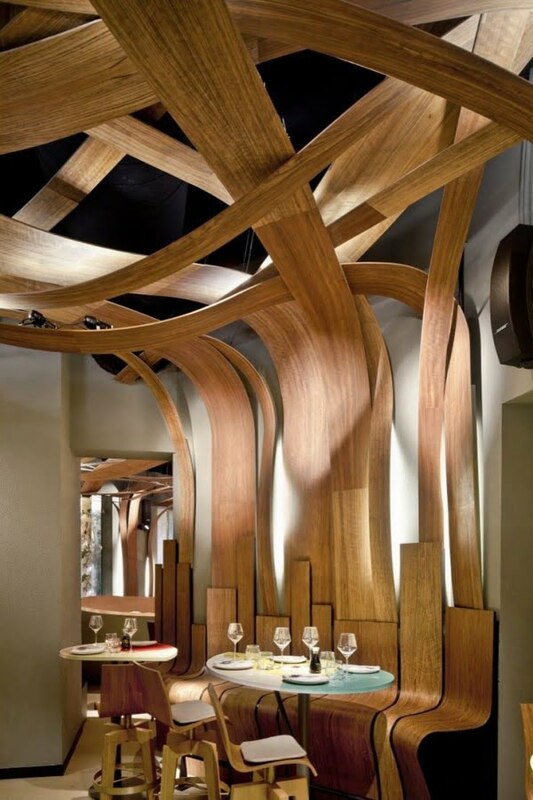 This amazing woodwork design is in the Villa De Bear restaurant in Bangkok. 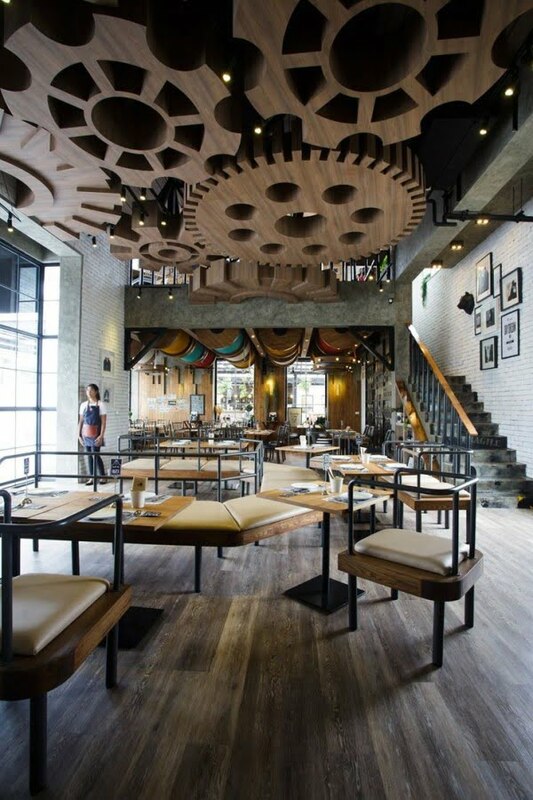 We’ll see several more restaurant ceiling designs as these places don’t usually shy away from creativity in decor. 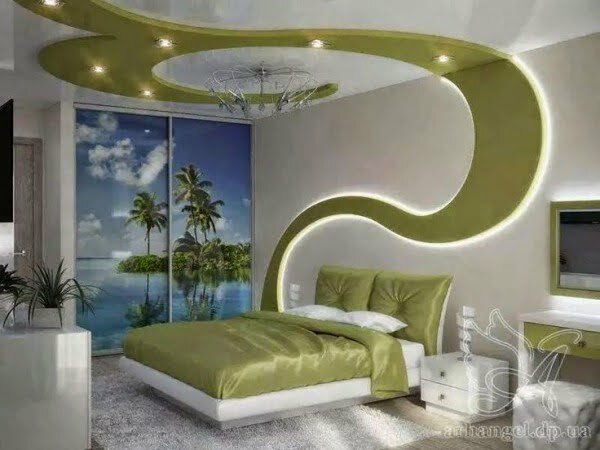 Surreal ceiling and wall decor accomplished with curvy plywood planks. 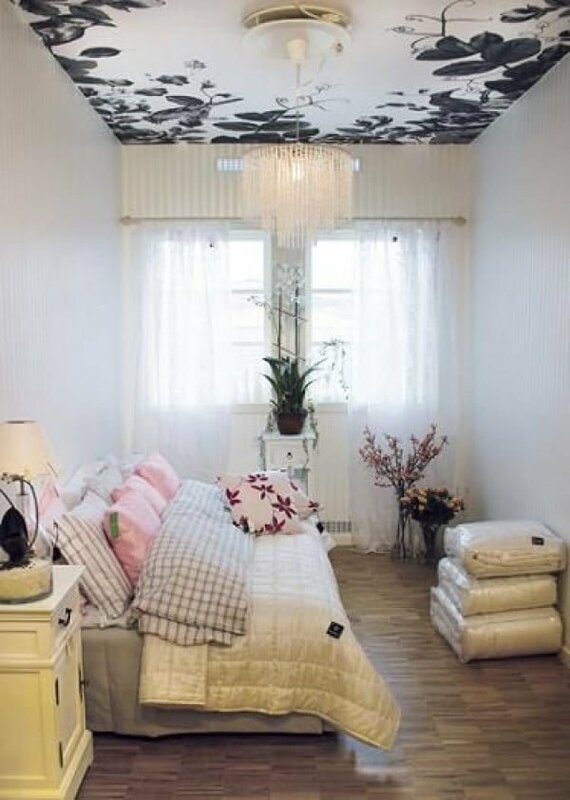 Getting back to home decor, this fragmented ceiling design floats above like an ice floe. I like the joint ceiling and wall designs like this because they transform the space and the way we look at it. 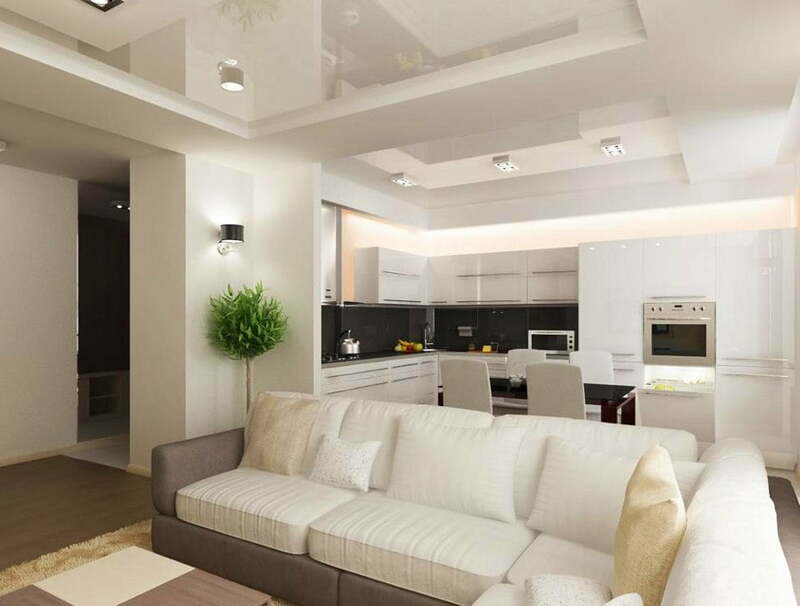 Multi layered ceiling design adds the third dimension to the usually flat ceiling. Using beams to decorate the ceiling creatively. 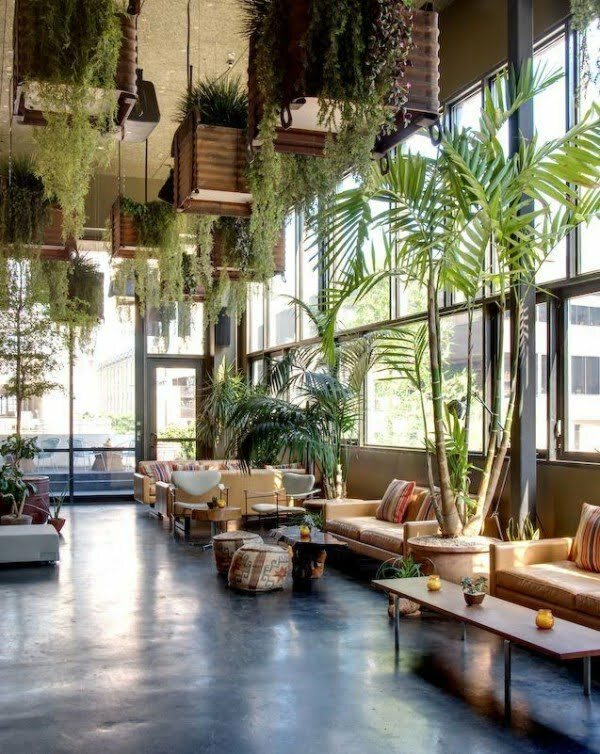 The amazing idea is to suspend green plant pots on the ceiling. Adding warmth by the woodwork in a cold office. 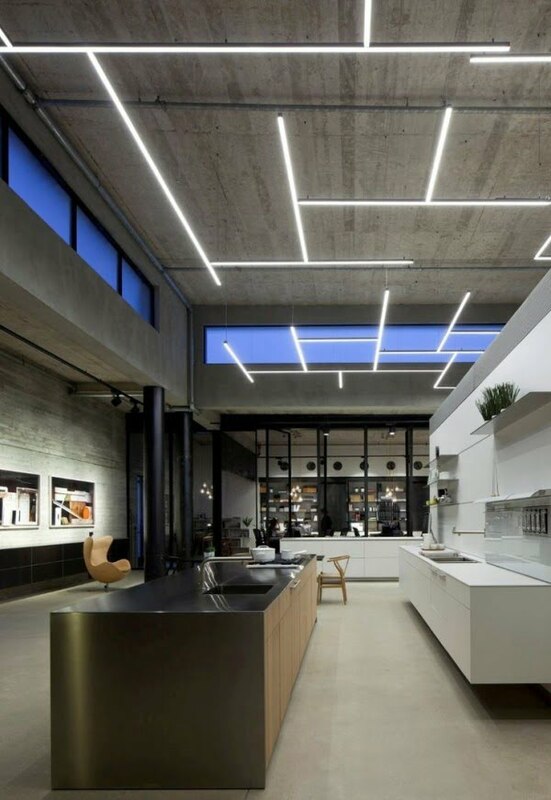 Futuristic industrial ceiling design achieved with clever use of lighting. Going vintage – we see a map ceiling mural. 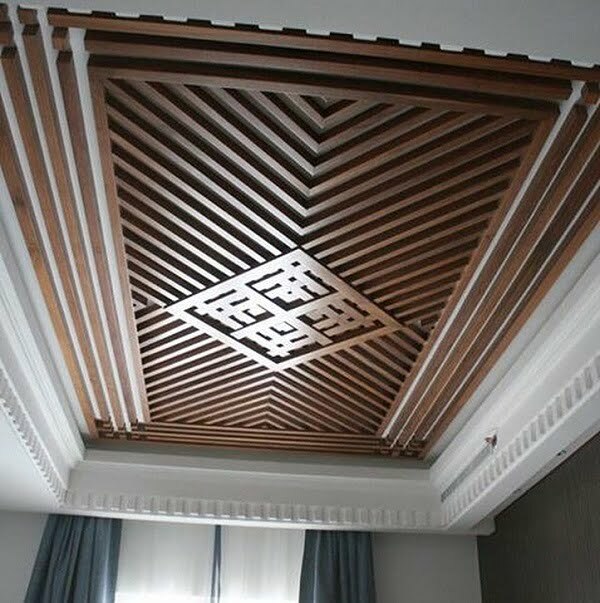 All wooden tray ceiling design, it’s a bit heavy but well compensated with furniture arrangement. Impressive ceiling created with a ton of suspended dynamic green tubes. 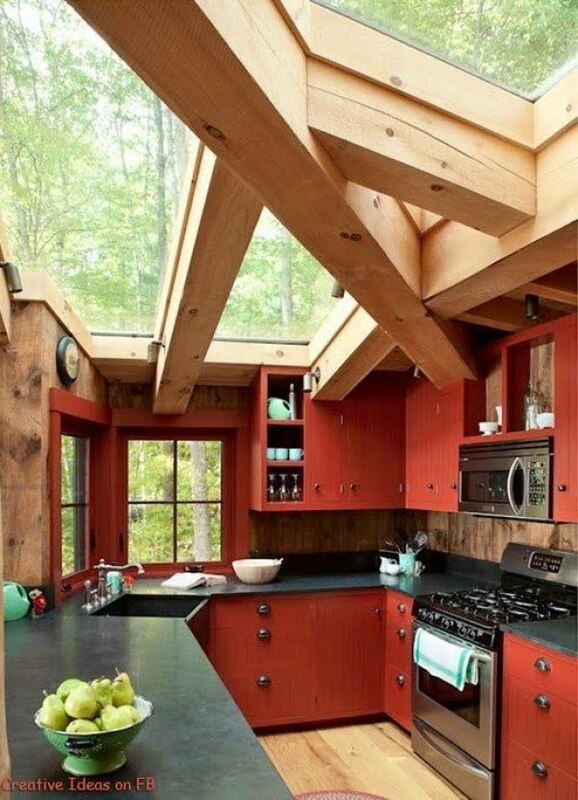 It’s not surprising to find such a design in a wooden getaway cabin, but it is as creative as it is practical. If you want to sleep under the stars, you don’t have to sleep outside for effect. 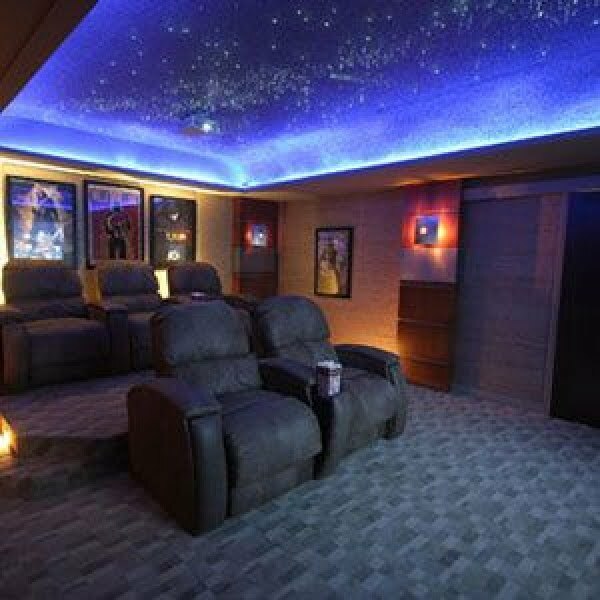 This home cinema has an amazing cosmic ceiling. 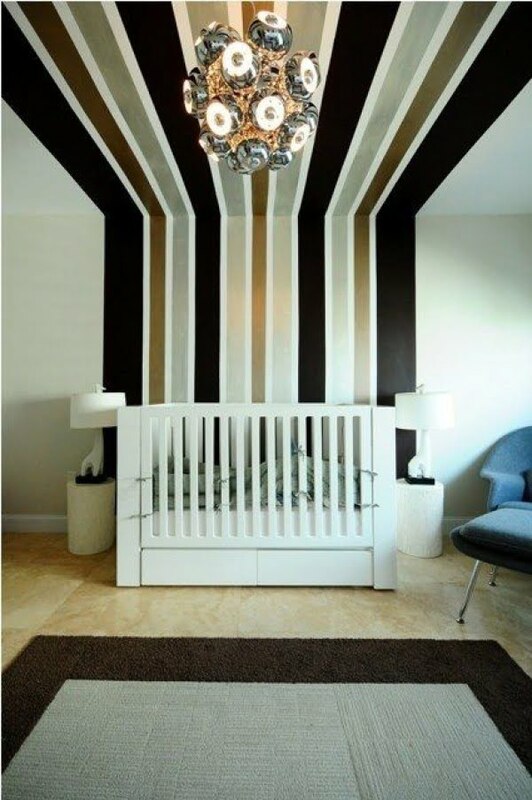 While it’s not the ceiling design per se, but decorating this way is truly unique and creative. 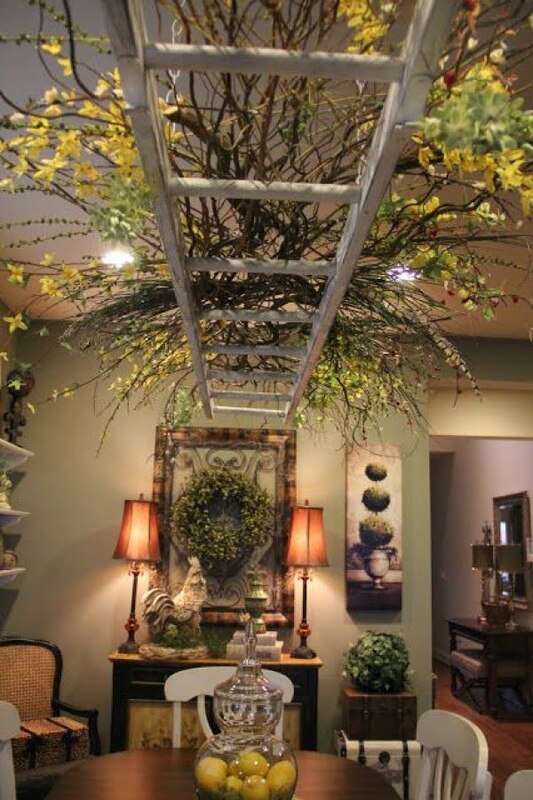 The use of the suspended ladder to add live greenery to the room for the rustic touch. This design is a bit comic but effective. I love the continuity of the design from the furniture through the walls to the ceiling. While this picture makes your head spin the intricate tray ceiling design with mirrors create a unique design effect to be admired. There’s a lot left to be desired in this room decor but the ceiling makes up for it ten fold. 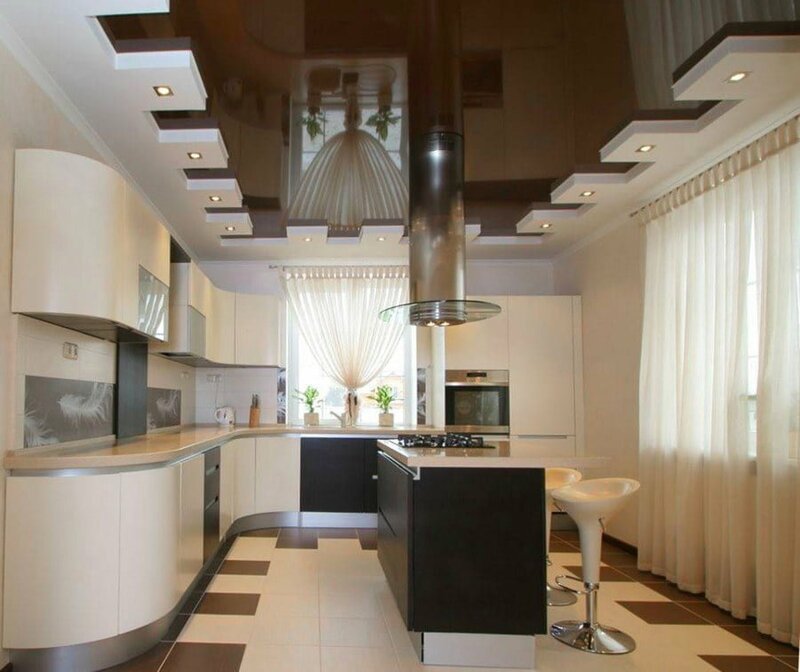 An exciting effect can be achieved using glossy tray ceiling. You’ll always enjoy how the reflections of sharp corners play on the glossy surface. The unique ceiling is no ceiling at all. Ceiling beams are very often used to create popping decor. More glossy surfaces and intricate trays. You also have to love the design of the cooker hood which looks like an upside-down coffee table. 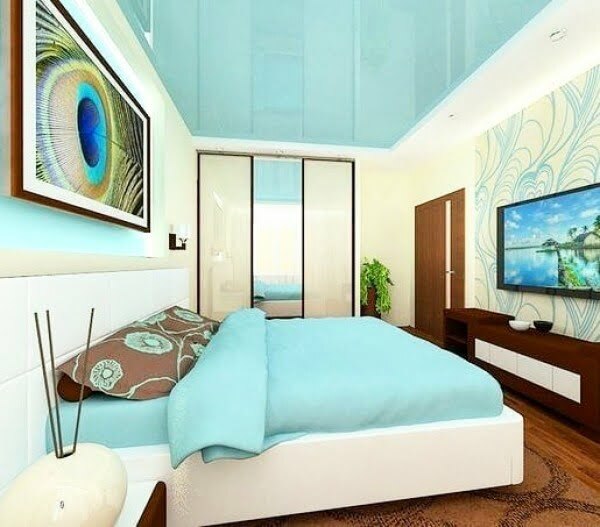 Vibrant colors can also be used to create a unique ceiling design. Purple is used in this case. 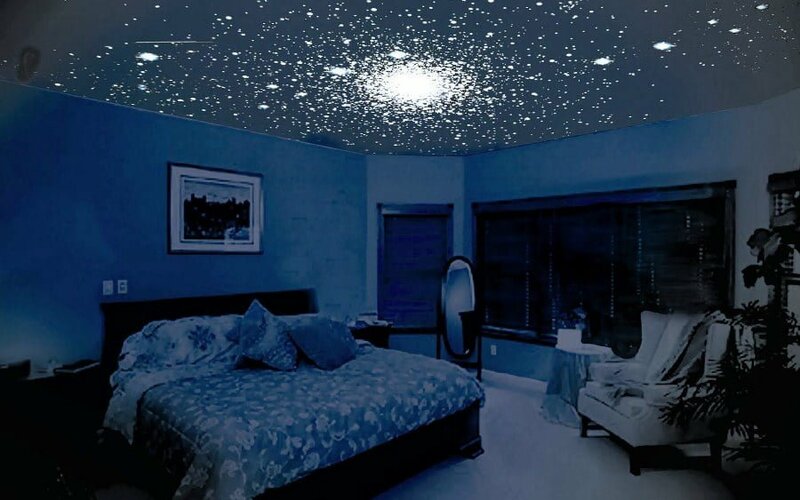 Or how about this starry night sky on your ceiling at night. 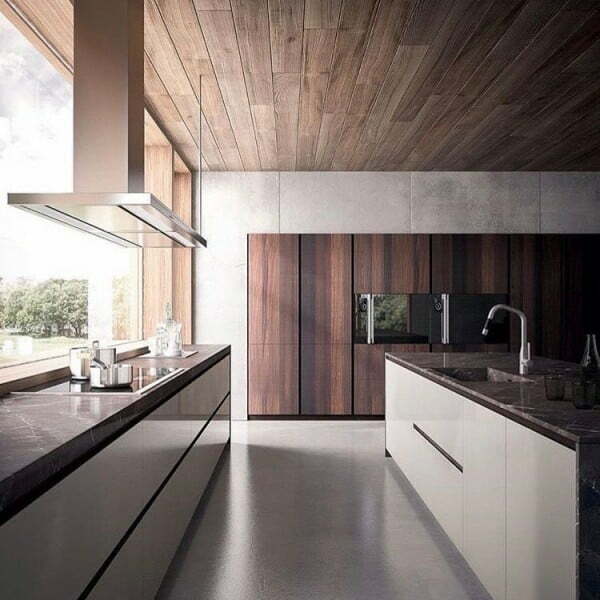 An elegant effect is achieved with simple wooden planks across the wall and the ceiling. And finally, it wouldn’t be an article about ceiling decor if we didn’t include this wonderful vintage ceiling design.